Under the slogan of a new start for peace, the inter-Korean Summit was the first meeting between Korean leaders in over a decade, and just the third since the end of the Korean War. Alec Forss, a project coordinator with ISDP’s Korea Project, discussed its implications with Korea expert Dr. Ramon Pacheco Pardo, KF-VUB Korea Chair at the Institute of European Studies of Vrije Universiteit Brussel and Senior Lecturer in International Relations at Kings College London. Just a few months ago, tensions on the Korean Peninsula had escalated to levels arguably not seen in decades. In hindsight, probably not even President Moon could have anticipated a summit meeting so soon. What has enabled the meeting to take place? The first and most important factor behind the recent easing of tensions in the Korean Peninsula leading to Friday’s inter-Korean summit has been President Moon’s diplomatic skills. President Moon was elected on a platform which included engagement with North Korea. He sought to provide an opening for dialogue even as Pyongyang conducted a battery of missile and nuclear tests throughout 2017. But the PyeongChang Games offered an opportunity for engagement that President Moon made use of through frequent invitations for North Korea to participate. Once the Kim regime accepted, the South Korean government engaged in shuttle diplomacy between North Korea and the US. This has taken us to where we are today. In addition, the Kim regime pursues a byungjin line that emphasizes the parallel development of a nuclear deterrent and economic reform. Once the former has been achieved, the latter can be prioritized – as Kim himself recently announced. But North Korea needs foreign investment, aid and expertise if economic reforms are to be successful. This has prompted Pyongyang to seek better relations with South Korea and other countries. The Moon administration has tried hard to build enthusiasm for the summit by televising parts of it and even creating a dedicated website where ordinary citizens can contribute their wishes. Indeed, building “national consensus” is a key strategy as part of Moon’s policy. At the same time, there is cynicism among some South Korean conservatives over North Korea’s intentions and apathy among the younger generation regarding unification. You were in Seoul during the summit. What is your sense of the mood among the South Korean public in reaction to the summit? I think that the summit has led to hope that peace can be achieved in the Korean Peninsula. The Moon government has been more transparent than previous administrations before and during the summit as a means to show that it has nothing to hide in its approach to North Korea. In addition, ten years of pressure under conservative governments have clearly not worked: North Korea has become a de facto nuclear state during this time. Thus, even though some conservatives and some groups within the younger generation are far from enthusiastic about inter-Korean rapprochement, most South Koreans agree that their government has to give engagement a try. After all, over 70 per cent of the population has a positive perception of the Moon government – to an important extent due to its North Korea policy. The outcome of the summit and the declaration that both Koreas want to work towards developing a peace regime for the Korean Peninsula has transformed this support into hope that the armistice that put end to inter-Korean hostilities more than 60 years ago can be replaced by a peace treaty. This is of course not the first inter-Korean summit with two previous meetings under Moon’s predecessors in 2000 and 2007. How does this summit compare? Do you think it met both Koreas’ expectations? In my view, there have been two key differences between this summit and the two previous ones. To begin with, South Korea has made clear that it has the upper hand, leading to symbolic but important concessions from North Korea. 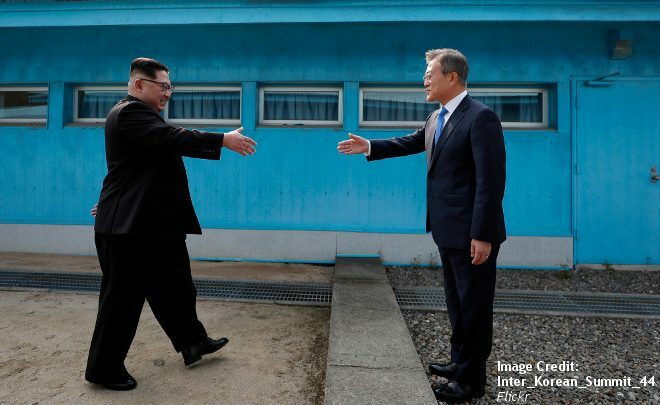 Thus, the summit hast taken place in the southern part of the inter-Korean border rather than Pyongyang – making Kim Jong-un the first North Korean leader to set foot on South Korean soil since the Korean War. Also, North Korea agreed to have parts of the summit broadcast and even to have Kim Jong-un read a statement in front of the media. Both were proposals coming out of Seoul. The impression was that North Korea dictated the terms during previous summits; this has not been the case this time around. Furthermore, the agreement coming out of the summit emphasizes denuclearization and not only cooperation between both Koreas. President Moon has been clear that steps towards denuclearization are to be part of any inter-Korean rapprochement. This was not the case during previous summits, when the impression was that North Korea was receiving substantial carrots in exchange for minimal concessions. In the lead up to the summit, there has been a lot of speculation on the sincerity of North Korea’s commitment to denuclearization and what it might demand in return. Did the summit make this any clearer? In my view, the summit has shown that the Kim regime is willing to put denuclearization on the table. This in itself is important, for it provides further confirmation that this is the case. And this confirmation comes in an inter-Korean document, rather than the words of one or another country. An agreement carries more weight. Having said that, two questions remain unsolved. Firstly, we still don’t know what the meaning of denuclearization is. Probably we will have to wait for the summit between Kim and President Trump for a clearer definition of this term. Secondly, we cannot yet tell the extent to which Pyongyang is truly committed to denuclearization. This we will only know in the coming months, once the agreements reached by the different parties with a say in the North Korean nuclear issue have to be implemented. The slogan for the summit is “Peace, a New Start.” So how do you think inter-Korean relations move forward from here? Is there a sense that this summit’s success ultimately depends on how the Trump-Kim Jong Un meeting plays out? It seems that we are at the start of a period of better relations between both Koreas. The summit has been an important confidence building measure, to a large extent thanks to North Korea’s behavior: a missile and nuclear test moratorium, Kim’s openness to discussing all matters, as well as the de-escalation in rhetoric by the North Korean press have all been helpful in this respect. Furthermore, the establishment of a direct phone line between Moon and Kim even before the summit cannot be downplayed – it is truly historic in the context of relations between both Koreas. Also, the Moon government has a policy of engagement and it will continue to implement it. Even though it is true that there are constraints due to the sanctions regime on Pyongyang and the ongoing issue of North Korean denuclearization, we can expect the Moon government to find ways to provide aid and economic support, as well as to engage the Kim regime through diplomacy. In fact, further meetings in the coming months are a real possibility. I actually think that the inter-Korean summit has set the stage for the proposed Trump-Kim meeting to have a positive outcome, rather than the success of this summit being contingent on that meeting. Finally, Moon Jae-in and Kim Jong Un come from different generations. While Moon was born of parents who fled the North during the Korean War and has always had a strong emotional attachment to reconciliation and unification, Kim Jong Un is the first North Korean leader to have been born after the country’s division. How did you view their personal chemistry and rapport during the summit? This was one of the biggest issues under discussion in Seoul during the summit. This was the first time that Kim could present himself directly to all South Koreans. I think he gave a good impression with his gestures and general behavior. Even seeing a North Korean leader smile was uncommon under Kim Jong-il, Kim’s father. In my view, Kim’s behavior resulted in very good personal chemistry and rapport with Moon. The South Korean president is outgoing by nature. In Kim, he found someone willing to reciprocate. Their 30-minute aside without any advisors but in front of the media was unexpected and full of symbolism. The personal chemistry displayed by both leaders will be important as inter-Korean engagement continues. Dr. Ramon Pacheco Pardo is KF-VUB Korea Chair, Institute for European Studies, Vrije Universiteit Brussel, and Senior Lecturer in International Relations at King’s College London.